The pioneer in double cask maturation shares a few thoughts about his favourite dram and the evolving whisky industry. 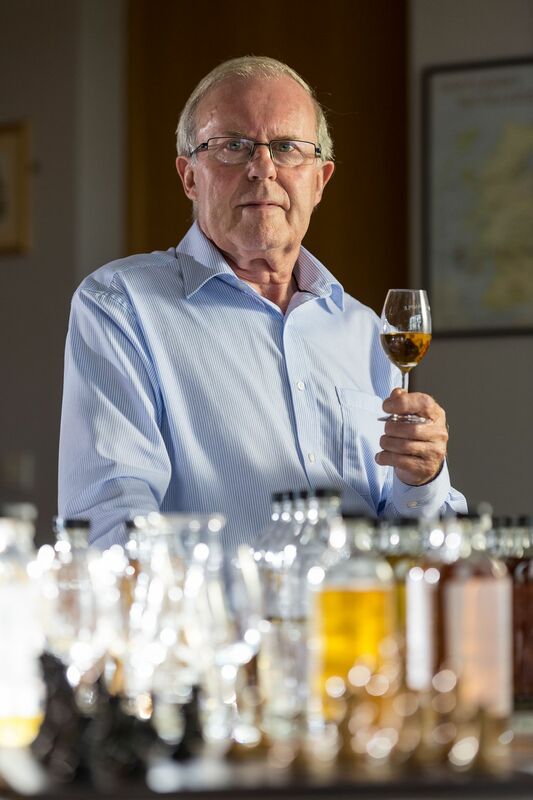 David Stewart, who has served as William Grant & Son’s (WGS) master blender for over 50 years, is one of the humblest people you’ll ever meet. During his tenure he helped put The Balvenie on the map by creating The Balvenie Classic, a unique expression that gave birth to the process of ‘finishing’ or maturing the blend in two different barrels. It changed the game completely, with many other whisky makers following suit. But he hardly talks about it, unless you ask. His contributions have earned him the prestigious MBE awarded by Queen Elizabeth II, but the doting grandpa, who lives in Glasgow, admits that he’s semi-retired now. He continues to be the guardian of the brand’s quality and consistency, and he relishes the role as it also allows him to pass on his knowledge to the next generation. We caught up with him at the recent DFS Masters of Wines and Spirits 2018 to reminisce about his illustrious career. How old were you when you first tasted whisky? David Stewart (DS): I think I was about 19. I had been working as a store clerk for William Grant & Sons for two years when my boss, who was the master blender then, brought me to the sample room to nose and taste various expressions. That’s how I got started in this role. How much has the industry changed since you started more than five decades ago? DS: It’s a lot smaller now. Back then, there were a lot more companies such as Dewar's, Black & White and Long John. Now, they’ve been taken over by either Pernod or Diageo. Tell us more about the technique you pioneered. DS: We started taking whisky from one cask into another in the early ‘80s, when we launched the whisky called The Balvenie Classic. We did a 12 Year Old and an 18 Year Old and we took the whiskies out of the American oak barrels with these different ages and transferred them into European oak sherry casks for a finishing period of a few months. We launched these expressions under The Balvenie Classic (range). In the early '90s, I was asked to refresh the range because the centenary year of The Balvenie was in 1993, so that’s when I launched the DoubleWood 12 Year Old ... and the whole industry started finishing their whiskies in sherry, bourbon, rum, Madeira casks, you name it. How has this affected the market? DS: Using different types of casks alter the flavours; this has increased the number of expressions the industry can release just by changing the finishing periods. DS: The Balvenie DoubleWood 12 Year Old because that really put us in the spotlight. We launched it in 1993 and it’s still part of our core range. I’m pretty proud of the way it has developed over the years and the how its sales has grown—this helped promote our other expressions. Now that you’re semi-retired, what’s your role at WGS? DS: I’m still the malt master. I took on the master blender role in 1974, and I was looking after blends such as Grants, Glenfiddich and The Balvenie. Since 2010, I’ve been working on a part-time basis, focusing only on the latter and making sure that the quality and consistency are there. DS: I’m based in Glasgow but my work requires me to travel a lot. Some days, I’ll be at the distillery to speak to people and take samples from their casks. Other times, I’ll be in the sample room to assess the spirits that could be turned into new expressions. I don’t have a routine and I never quite know what’s going to happen from one day to the next. In that sense, I’m very lucky. What are the upcoming trends in the industry? DS: The industry has changed a lot over the years with finishing and ages; we have no age statements to malts as well. I’m not sure where it’s headed to next but we’ve got to abide by certain laws (when) working on things like casks and oaks. We’ve always got things in the warehouse and we’re constantly experimenting and innovating. How do you drink your whisky? DS: Very quickly. People don't understand that you can actually add water to Scotch whisky. It opens up the flavours and brings down the alcohol level to 25 or 30 per cent. I like it especially when I’m drinking a 12 Year Old. If you can have a drink with anyone, who would it be? DS: Well, my favourite drink is The Balvenie Portwood 21 Year Old, so it would probably be with someone who likes it too. It would be quite nice to sit down with them, savour it and chat about its style and quality. Travel What's Inside The World's Second Most Expensive Hotel Penthouse?